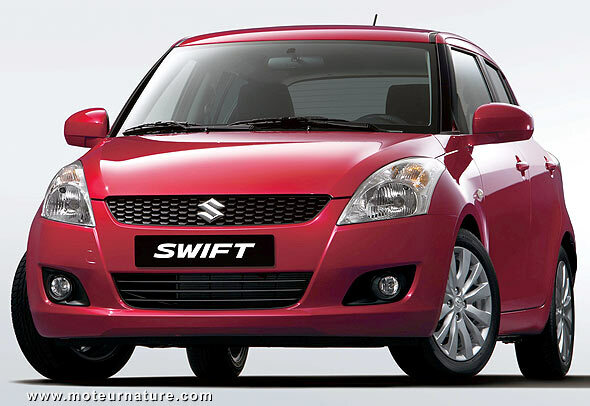 The Suzuki Swift has not been sold in the USA since 2001, but the current model has been selling well in Europe. As Suzuki’s introducing a new generation, there’s good chance that it could be sold again in America. There would certainly be a market for it as it appears to be a new fuel economy leader. Of course, the Swift is a small car, so you expect it to be thrifty on fuel. The Swift is a bit larger than the Toyota Yaris hatchback, but smaller than the new Ford Fiesta. It comes with a new 1.2-liter engine, a small unit, but very modern, with fully variable valve timing, on both the intake and the exhaust side. Its 94-hp rating will not get anyone excited, but that is much enough for everyday use. On the european cycle, the new Swift is given for 47 MPG. For a car that isn’t hybrid, that doesn’t even have a Stop & Start system, nor a diesel engine, this is impressive. It should convince customers just with this. If you add Suzuki reliability and affordability in the equation, the brand might have a winner in his hands. The european version is built in Hungary, but we guess it would come from Japan if it comes in America. Will it come? Ask your Suzuki dealer for it.